OXFORD, ENGLAND—The city of Thonis-Heracleion, which is now submerged in Egypt’s Aboukir Bay, served as the gateway to Egypt during the first millennium B.C. 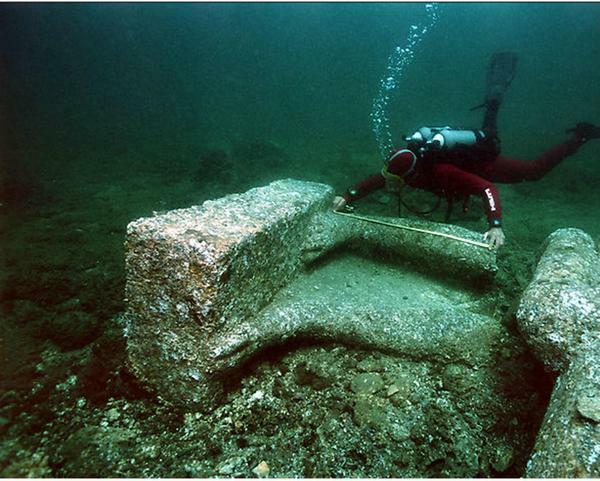 Scholars from the Oxford Centre for Maritime Archaeology and the European Institute for Underwater Archaeology, working in cooperation with Egypt’s Ministry of State for Antiquities, think that incoming cargoes were unloaded at Thonis-Heracleion, assessed, and reloaded onto Egyptian ships for transport up the Nile River. Their recent survey located 64 Egyptian ships that may have been deliberately sunk, in addition to Athenian trading weights, coins, and statues of Egyptian deities such as Osiris, Isis, and Horus. “Thonis-Heracleion played an important role in the network of long-distance trade in the eastern Mediterranean, since the city would have been the first stop for foreign merchants at the Egyptian border,” said Elsbeth van der Wilt of the University of Oxford.